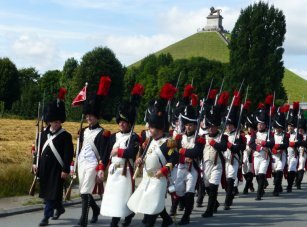 Some have remained in a state close to that fighters roamed at the time: either because they have been protected (Waterloo) or because their rurality has avoided them, for now, a too visible transformation (Marengo, Austerlitz, Eckmühl, Champaubert, Friedland...). Of course, some electrical or telephone poles and wires, some antennas or satellite dishes, some cars or tractors, some advertisement billboards were added to those places (one must move with the times, even in the countryside); but the photo retouching softwares can often remove them, so we can see before us a state close to that as valiant veterans, and the Emperor himself, saw. But alas it is not of same everywhere. Cities, especially, have been greatly transformed, sometimes even in their historical center. Some quintupled or tenfold of size (Alessandria, Mantua, Vienna and its surroundings, Vitoria, Laon, Montereau ...), others were disfigured during subsequent conflicts (Reims during World War I, Ulm during World War II). Housing estates have flourished even in the countryside (Wagram, Vauchamps); when this is not one of those awful commercial areas, over several dozen acres, that has settled over much of the battlefield (La Favorita near Mantua, Mont-St-Pierre at Tinqueux near Reims). Then, a church, a few walls, a piece of land are all that remains to be seen... for how long? We have not visited all the Napoleonic battlefields, far from it. Our next years will be devoted to enriching the iconography. Then some younger persons will take over from us, we hope so, to complete this work. Because images never die. Castiglione delle Stiviere: Napoléon Bonaparte's headquarters, Piazza Colonna [today Piazza Ugo Dallò] on August 4 and 5. Alteglofsheim: the castle , where Napoleon spent some hours the night after the battle. Athies: the mound called "Butte aux Vignes"
Many thanks to Mr Dominique Timmermans (visit his website Association pour the Conservation of the Monuments Napoléoniens), who made us discover this battlefield. St-Amand: location called "Le Hameau" and the creek "La Ligne"
Sombreffe: the rectory and its little peaceful interior: cannonball, a witness of fights and door having suffered the wrath of Blücher and his sword! The surroundings of Crespiatica , where the French made their cavalry rest after the battle. GPS coordinates of the Pyramids of Giza : a good Napoleonic tourist, on site, must be able of finding these pyramids without the help of their coordinates! The Quatre-Bras farm , the only building from the Napoleonic period still present today at the eponymous crossroads, which was held by the Allies. The Sainte-Geneviève hill [today Parc de la Cure d'air], from where the Emperor directed the fights and where he bivouacked the evening following the battle. The tablet honoring, there, the fallen "Marie-Louises" (youngest French soldiers) is unfortunately in a pitiful state, unworthy of the honor due to them. The river Vesle , between Fismes and Reims. Waterloo: Wellington's headquarters ; that city gave its name to the battle, although none fight occured there! This website has been designed for a screen resolution of 1280 x 800 pixels. Last update: 2019-04-08 21:27:05.